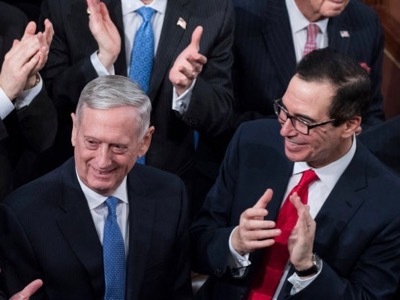 Secretary of Defense James Mattis applauded by United States Secretary of the Treasury, Steven Mnuchin. For his visit to Moscow on 8 November, ambassador James Jeffrey was tasked with explaining the current US obsession with the expansion of Persian influence in the Arab world (Saudi Arabia, Bahrein, Iraq, Lebanon, Syria, Yemen). Washington now wishes to formulate this question in geo-strategic rather than religious terms (Chiites/Sunni), while Teheran is organising its national defence around forward posts composed of Chiite Arabs. Moscow then considered the possibility of negotiating on Teheran’s behalf for the easing of unilateral US sanctions, in exchange for its military withdrawal from Syria. President Vladimir Putin confirmed his proposition, not only for his US opposite number, but also for the Israëli Prime Minister, during their meeting in Paris on 11 November for the celebrations marking the centenary of the end of the First World War . He attempted to convince the Westerners that Russia alone in Syria was preferable to the Irano-Russian tandem. However, he could not guarantee that Iran would have sufficient authority over Hezbollah – as both Washington and Tel-Aviv pretend – to be able to order it to withdraw also. Washington’s only answer, nine days later, was to announce the eleventh series of unilateral sanctions against Russia since the beginning of August. This was accompanied by a ridiculous speech according to which Russia and Iran had together organised a vast plot aimed at maintaining President Assad in power and expanding Persian control in the Arab world. This rhetoric, which we believed had been abandoned, assimilates three states (the Russian Federation, the Syrian Arab Republic and the Islamic Republic of Iran) as machines in the service of three men (Bachar el-Assad, Ali Khamenei and Vladimir Putin) who are united by the same hatred of their respective peoples. It ignores the massive popular support they enjoy, while the United States are profoundly torn apart. We can leave aside the stupid assertion that Russia is aiding and abetting the conquest of the Arab world by Persia. According to the US Secretary of the Treasury, Steven Mnuchin, who presented the unilateral US sanctions on 20 November, they do not form the economic section of the present war, but are intended to punish the « atrocities » committed by these three « régimes ». However, on the verge of winter, they mostly concern the supply of refined petroleum to the Syrian people so that they may light their homes and keep warm. It is not necessary to specify that the three states targeted deny the « atrocities » of which they are accused, while the United States pursue the wars that they started in Afghanistan, Iraq, Libya and Syria. 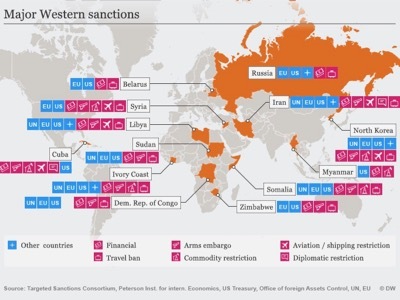 The US sanctions were not decided by the United Nations Security Council, but by the United States alone. They are illegal in international law because in order to make them lethal, Washington is attempting to force third-party states to associate themselves with the motion, which constitutes a threat to the states targeted and therefore a violation of the United Nations Charter. The United States have the sovereign right to refuse to enter into commerce with other states, but not to exercise pressure on third-party states in order to harm their targets. At one time, the Pentagon claimed that inflicting damaging treatment on a particular nation would lead its people to overthrow its government. That was also the theoretical justification for the bombing of Dresden during the Second World War and the endless embargo against Cuba during the Cold War. However, in the space of 75 years, this theory has never, absolutely never, been verified by the facts. Now the Pentagon is considering using detrimental treatment against a nation as a weapon of war like any other. Embargoes are designed to kill civilians. The ensemble of systems currently used against Iran, Russia and Syria constitute the most gigantic siege system in History . These are not economic measures, but – without any possible doubt – military actions implemented in the economic sector. In time, they will probably lead to a division of the world into two parts, just as in the period of USA-USSR rivalry. Secretary Mnuchin insisted at length on the fact that these sanctions were aimed above all at the interruption of the sale of hydro-carbons, meaning depriving these countries – mostly exporters— of their main financial resources. Syria is presently unable to refine petrol since its installations were destroyed either by Daesh or by the international Coalition’s bombing raids against Daesh. For the last four years, Iran has been supplying refined petrol to Syria in violation of previous unilateral US sanctions. This petrol is transported by Western companies working for the Russian public company Promsyrioimport. This company is paid by the private Syrian company Global Vision Group, which is itself financed by the Iranian company Tabir Kish Medical and Pharmaceutical. Finally the Global Vision Group transfers a part of the money it receives to Hezbollah and Hamas. The international Coalition has the official objective of fighting Daesh. However, numerous testimonies over the last four years attest that it had alternatively bombed the Islamic state whenever it exceeded the zone which had been allocated to it by the Pentagon (the Wright plan), and that, on the contrary, it had parachuted weapons to Daesh in order to maintain its position in the specified area. The two entities worked together to destroy Syrian refineries. What is the purpose of implicating the Russian government in the transfer of petroleum from Iranian refineries towards Syrian ports? Why would Iran suddenly need Syria to transfer money to Hezbollah and Hamas? Why would Syria transfer Iranian money to Hamas while the Palestinian organisation – whose leaders are members of the Muslim Brotherhood – is at war with them? Steven Mnuchin doesn’t bother with long explanations. As far as he is concerned, Syria is criminal state and Russia is its accomplice, while Iran, Hezbollah and Hamas are all « terrorists ». This is the most important point, the word that cancels out thought. A French proverb assures that « When you want to drown your dog, you claim it has rabies ». So there’s no point expecting logic in Secretary Mnuchin’s answer to President Putin’s proposition of mediation. Progressively, the United States are withdrawing their troops from the conflicts in which they were engaged, and replacing them with mercenaries on the ground (the jihadists) and economic sanctions, the modern version of the medieval siege. Although during the Middle Ages, Christianity accepted wars between the Catholic sovereigns, it condemned military actions against civilians. In the 13th century, the Catholic Church therefore condemned all sieges when they concerned not only soldiers but also populations. This ethic has remained that of the Holy See until today. For example, Pope John-Paul 2 opposed the United States when they applied economic sanctions against the Iraquis during the reign of Saddam Hussein. His successor, Pope Francis, remains silent on this question.